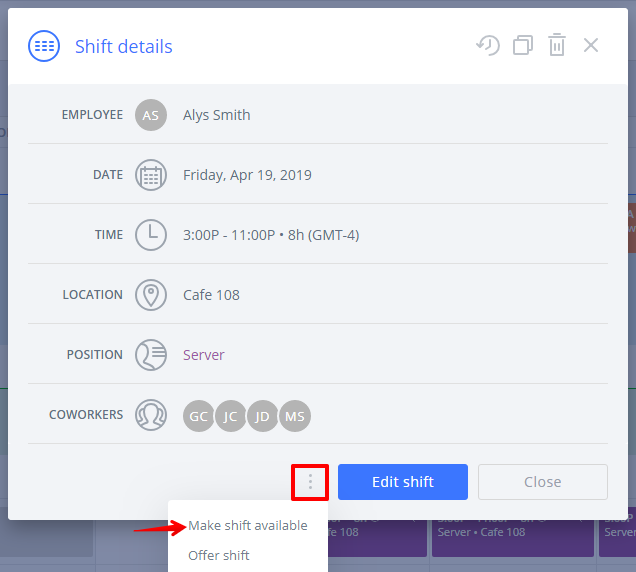 If you have uncovered shifts in the unassigned row or you would like to allow your employees to choose their own shifts, it's very easy to move them all to the available shifts row. This will make them visible to your employees and will assist you in covering open shifts. Related: What is the difference between Unassigned and Available shifts? Individual shifts can be moved by drag and drop. This applies to unassigned shifts as well as assigned shifts, so if an employee notifies you that they are not able to work a shift already assigned to them, you can move it easily to remove it from the employee and also find coverage. Additionally, you can click the shift to open its details and then click the options button (3 dots) to make a single shift available.